Officially, the county of Avon no longer exists but the area it once covered is still an official bird recording area. For more than 25 years the Avon bird report has been produced by the Avon Ornithological Group, a joint venture of the Bristol Ornithological Club and the Bristol Naturalists Society. The recording area is made up of 4 unitary authorities; South Gloucestershire, Bath & North East Somerset, Bristol and North Somerset. The “Avon List” total is over 334 species with an average of about 215 species recorded each year. Back in 2000 I set myself the challenge to see as many species that year within the recording area as possible. I became an expert on the the “County” borders, knowing which fields, woods, areas of gorse etc. held the birds that I wanted to see. The year was very enjoyable, not only did I visit some wonderful areas and habitat but thankfully saw many interesting birds. I was rewarded for my efforts in seeing 204 of the 221 species reported that year. Rarities included three species new to the area; Cory’s Shearwater, Lesser Scaup and Booted Eagle along with White Stork, Ring-necked Duck, Ferruginous Duck, Osprey, Iceland Gull, Wryneck, Nightjar, Great Grey Shrike and Rose-coloured Starling. My favourite sight was the Barn Owl flying around me on a warm mid summer evening. I decided to make an effort again this year. I don’t expect to match my 2000 total but I am sure I will see some excellent birds in some interesting habitats. I intend to keep a diary page and hopefully will capture some decent images with my camera. I hope that others will find the sightings interesting and follow my progress. By 4 PM today, with heavy rain and near darkness I finally gave up for the year. I am very pleased with my personal total of birds in what was an excellent year for Avon birds. I would like to thank the many local birders who found the birds or provided me with the breaking news for many of the birds I managed to see. My most shocking bird was the Chough, my best find was a Stone Curlew, my most disappointing missed bird was Sandwich Tern, missing one by a few seconds. It would be difficult to say what my favourite sighting was having had so many great experiences but the numerous “Petrel days” will be hard to forget. I will have a quieter 2007 but am already making plans for another big Avon year in 2008. Yes I know it is Christmas day, but I always make a point of getting out for a brief search before over indulging in lunch. I decided to take the dog for 15 minute look from New Passage and saw a Little Egret at distance on Northwick Warth. Just as I thinking this was going to be the most notable bird of the day I saw a Diver floating down the tide line. I quickly removed my camera from the bag and identified it trough the view finder as a Great Northern Diver. The bird floated away quickly on the falling tide so I scampered over the boulders onto the sea wall and managed to get a few shots before it disappeared from view. 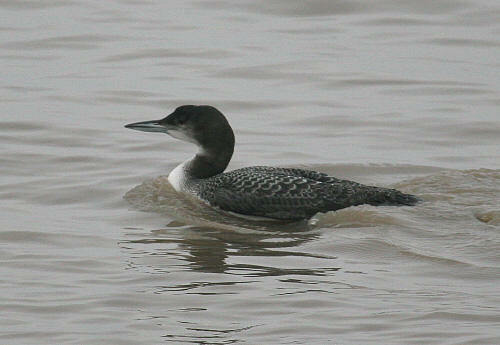 This was my second Great Northern Diver of the year after the individual I saw back in early January at Barrow Tanks. More importantly for me, it was my 172nd species seen by me on my Severnside patch this year, smashing my previous best annual total of 167. A respectable variety of birds for a six mile stretch of river bank. A late afternoon visit to Chew Valley Lake failed to produce the Glaucous Gull seen yesterday. I thoroughly searched the many thousands of Common Gulls with Black-headed, Herring and Lesser Black-backed Gulls and saw 4 Mediterranean Gulls for my troubles. I went to Northwick Warth today attempting to photograph some Water Rails near the “Grebe pond”. Although I managed to see one several times in the open, the views were very brief an d the light conditions were too poor. Walking back to my car feeling disappointed, I heard a crest calling from scrub on the old target mound. I quickly played an MP3 file of a singing crest from my mobile phone and to my pleasant surprise a Firecrest appeared briefly in front of me. The light conditions remained very poor but I still managed to get a record shot as this bright gem of a bird moved quickly through the scrub. 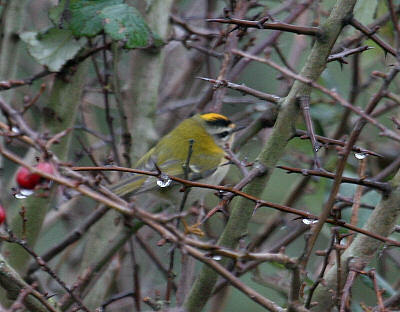 This was my second Firecrest in Avon this year following my other way back on new years day. Good birds still keep getting found. 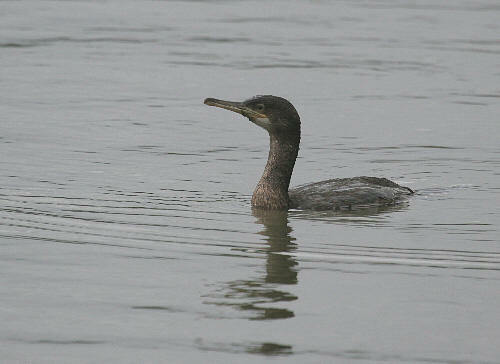 The briefest of visits to Clevedon boating lake produced 2 welcome Shags, a difficult bird to see in Avon. These birds were feeding just a few metres from the footpath but were still not easy to photograph as they continually dived for small fish. An adult Mediterranean Gull was also present here. I was photographing a Purple Sandiper at New Passage this morning having just seen another 2 Leach’s Petrels and a Guillemot when my mobile phone rang. On the screen was the name of a Chew valley lake birder. I immediately thought that the Red-necked Grebe had been relocated but the news was about a Long-tailed Duck. Within an hour I was sat in the Stratford Bay hide trying to see a distant duck that seemed to spend 90% of the time below water that always seemed to surface in a different area. To make things worse, in the rush to get there I had left my telescope at home but luckily borrowed one to get a better look of a female type LTD. Not the most impressive looking wildfowl but a bonus for the Avon year list. With no let up in the wind the seabird influx continued. 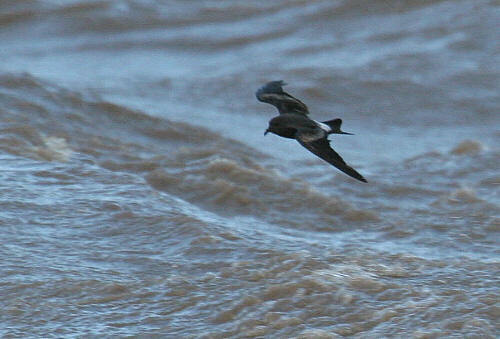 Looking from an upstairs window I saw a good number of Leach’s Petrels and a Great Skua. I popped out for awhile to take some more pictures and managed to see 6 Great Skuas including one feeding on a dead gull, at least 20 Leach’s Petrels, 20 plus Kittiwakes and a first winter Little Gull. A Red-necked Grebe was reported from Chew Valley Lake this morning, when the wind drops I might go and look for it. The weatherman was correct at last with gales overnight and a strong gusty wind this afternoon. 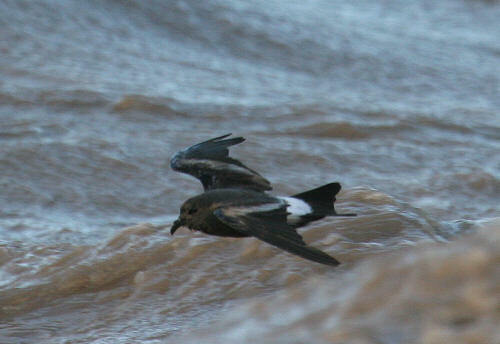 I knew that the incoming tide at Severn Beach would produce some seabirds. 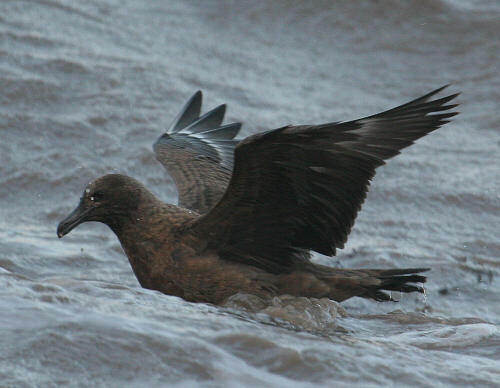 Within a minute a Great Skua flew up in front of me, over my house and then continued on inland. 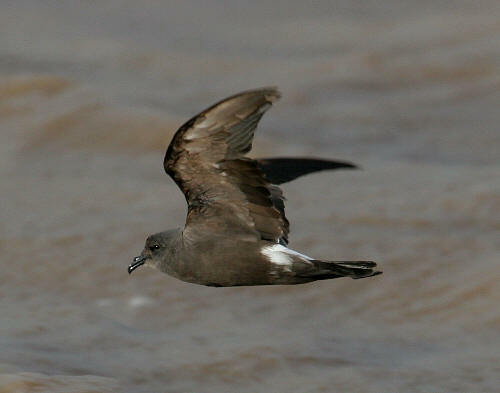 A few minutes later a Leach’s Petrel sheared up river 50 yards from the shore. I eventually managed to get close to one of seven of these fantastic birds and obtained my best Leach’s pictures yet. The local Herring Gulls were also very interested in these small birds and spent great deal of time trying to catch them without success. 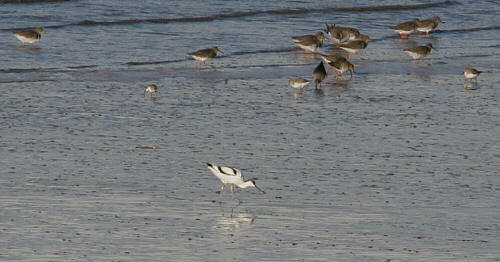 I received a call while I was in work this weekend about a colour ringed Avocet on Severnside. It was still present at distance when I arrived in the afternoon and was only my second of the year and always nice to see. 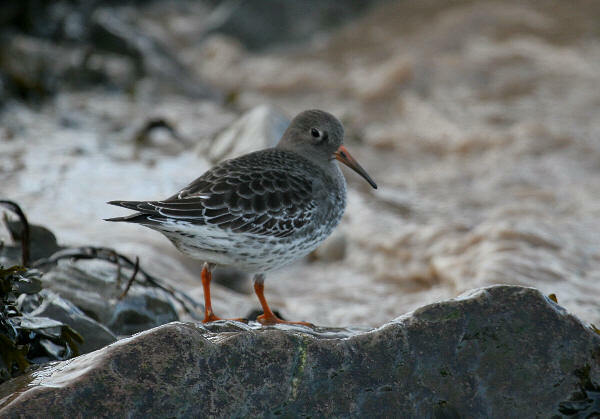 Results of early investigations show that this bird was ringed in France and I am waiting for further details.